Delphia Yachts S.A. began life in 1990 as Sportlake S.A. making small sailing boats and has grown to now being one of the largest boat builders in Poland. The company officially changed its name to Delphia Yachts in August 2003 when it's new range of sailing cruisers were launched. 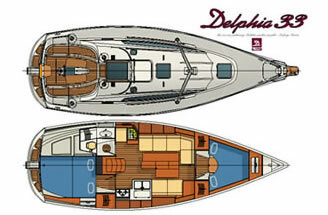 Currently Delphia Yachts manufacture the Delphia Yachts, Cortina, Europa Yachts, Phila & Sportina brands. There are 8 impressive yachts in the Delphia range, the Delphia 26, Delphia 28, Delphia 29, Delphia 33, Delphia 37, Delphia 40, Delphia 40 with Cabin and the Delphia 47. The following descriptions will give you an overveiw of these yachts. The Delphia 29 has a high standard of equipment specification which puts it firmly in the luxury cruiser class. The interior has a light and spacious feel with the main cabin featuring an excellent galley with ample storage and working space. Internally the Delphia 29 is very spacious for a boat of this size. The fore cabin features a generously sized double berth with storage lockers. The excellent aft cabin has a large double berth with ample stowage space and hanging locker. The spacious, light and well finished interior of the Delphia 29 gives a feeling of homeliness and quality with the large folding table able to accommodate the whole crew. A notable lack of interior mouldings adds to the quality feel with all finishing in light mahogany. The performance of the Delphia 29 under both sail and motor is outstanding. It is fast, stable and easy to handle by both experienced and novice sailors alike, inspiring confidence and enjoyment. 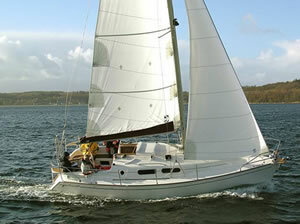 The Delphia 29 is priced at around £ 43,466 INC VAT. The Delphia 37 brings offshore cruising within the scope of all. Luxuriously equipped and finished with either an " Owners" 6 berth Version featuring 2 large double cabins, heads and shower compartment or an 8 berth version featuring 3 double cabins and a combined heads & shower. The Delphia 37 offers comfortable go-anywhere cruising. A furling headsail is standard on the Delphia 37 and all lines lead aft to the spacious cockpit meaning that short handed sailing is simplicity in itself. Her modern fractional rig is easily handled, allowing fast passage making. The engine offered as standard with the Delphia 37 is the new 30hp Volvo D1-30 sail-drive and with a large fuel tank your cruising grounds can be far and wide. 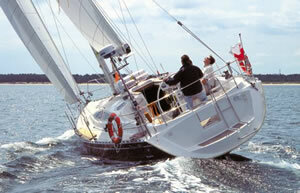 The Delphia 37 is an attractive and cost efficient alternative to many so called prestige marques. They had the first Delphia 37 to be delivered to the UK, arrive at Plymouth just before Christmas. This boat called 'Island Spirit' has the 8 berth layout and is owned by The Island Cruising Club at Salcombe in South Devon. Another 6 Berth (2 double cabin) version delivered in early August, called 'Credeau' is now based at Wolverstone Marina near Ipswich. The Delphia 37 was tested by David Harding from PBO Magazine in mid February in 'Lively' conditions, you can see his report in the September 06 edition of PBO Magazine. The Delphia 37 starts at a very competitive £72,748 (Including VAT). The Delphia 40 brings blue water cruising within the scope of all. Luxuriously equipped and finished with either a standard 3 double cabin layout with a large en-suite forward cabin, an " Owners Version " featuring 2 Double Cabins & 2 Heads, or a " Charter Version" featuring 4 Double Cabins & 2 Heads. The Delphia 40 offers comfortable go-anywhere cruising. The Delphia 40 is an attractive and cost efficient alternative to many so called prestige marques. A furling headsail is standard on the Delphia 40 and all lines lead aft to the spacious cockpit meaning that short handed sailing is simplicity in itself. Her modern fractional rig is easily handled, allowing fast passage making. The engine offered as standard with the Delphia 40 is the excellent 40hp Volvo D2-40 or as an option the Yanmar 3JH4E s ail-drive. With a 210 litre fuel tank your cruising grounds can be far and wide. 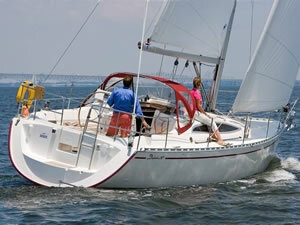 The Delphia 40 is a fast, safe and comfortable cruising yacht. The first boat delivered by the UK and Ireland distributors was delivered to Plymouth in August 05. This boat was tested by Duncan Kent from Sailing Today magazine in March and his excellent review was published in the August edition of Sailing Today Magazine. Introducing the latest addition to the Delphia range the brand new Delphia 33. The Delphia 33 fills the gap between the very successful Delphia 29 and the larger Delphia 37. 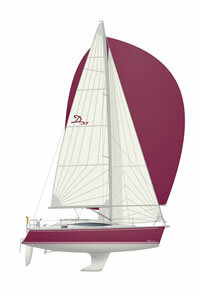 The new Delphia 33 follows the same beautiful sleek lines of the Delphia 37 & 40. This new model will initially be available in a fixed keel version with a lift keel version being developed later next year. The Delphia 33 will be powered by a shaft drive Volvo-Penta D1-30 engine and will have 2 double cabins plus 2 settee berths in the saloon. This model will have a Category 'A' rating for 6 persons.